Fans of good old-fashioned dirty rock music rejoice! 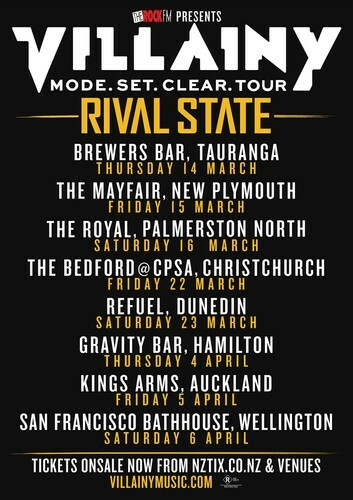 Two of New Zealand’s most exciting new rock bands join forces in 2013 and take their guitars out on the road. The Rock presents: Villainy with Rival State – Mode. Set. Clear. tour 2013. Villainy launch into 2013 with an 8-date nationwide tour joined on all shows by special guests Rival State. Released in October, Villainy’s album Mode. Set. Clear. debuted at number one on the New Zealand Top 40 chart and features three massive rock radio hits - 'The Answer', ‘Gather Yourselves’ and no. 1 single 'Alligator Skin'. The ferocious and energetic sound captured on the album is even bigger, louder, harder and faster on stage. With support slots for Incubus, Seether and I Am Giant this is the band that has ruled the rock airwaves of 2012. ‘Apollo Me’, Rival State’s debut album also shot in at number one on the NZ Album charts following on from the huge success of singles ‘Sleep Talker’ & ‘Four Leaf Clover’. A band that’s used to living on the bones of their arses sleeping on floors during grueling van tours of North America, these guys have a no holds bar approach to their shows bringing high-powered grooves and anthemic vocals to the stage. Villainy with Rival State – Mode. Set. Clear. Tour is one rock fans do not want to miss.